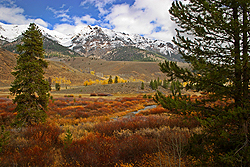 The gold and rust of autumn at Prairie Creek converge last weekend with a dusting of pre-winter snow in the Boulder Mountains, north of Ketchum. Up and down the Wood River Valley, residents are saying this is one of the best fall colors seasons in recent memory. Photo by Greg Stahl. What is the future of Old Hailey?